* Wash grains separately in two to three changes of water or until the water runs clear. If you are using freekeh, put it into a pan and cover with the boiling hot stock or water. Bring to the boil and simmer, lid on, for 25 minutes, adding the quinoa for the final 10-12 minutes. * If you are using cracked or bulgur wheat, place it in a pan with the quinoa, cover with the boiling hot stock or water, and gently boil for 12-15 minutes. When the grains are tender, drain thoroughly in a sieve to remove as much moisture as possible. * Meanwhile, steam the broccoli for about 3 minutes and the sugar snaps for 1 minute or until they are tender but still have a crunch. * In a bowl, combine the dressing ingredients with plenty of salt and pepper, taste and add extra lemon juice if needed. 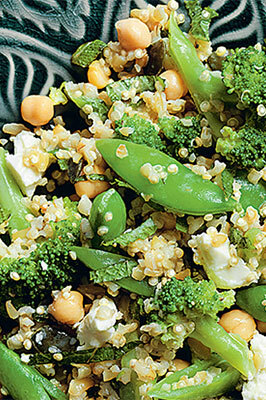 Mix with the still-warm grains and chickpeas. Then add the vegetables, seeds, feta, alfalfa sprouts and mixed leaves. Toss and serve straight away.